Dr. Samuel Adu-Poku is an associate professor and coordinator of undergraduate and graduate programs in art education at the Department of Art, Youngstown State University (YSU) in Ohio. Samuel received his Ph.D. and M.Ed. degrees in Curriculum Studies (Art Education) from the University of British Columbia and the University of New Brunswick, Canada respectively. He obtained his B.A. Art degree and teacher education certification and licensure from the University of Science and Technology in Ghana. Samuel currently teaches undergraduate and graduate courses and provides leadership in developing the art education program at YSU. Samuel has a reputation as an artist/ researcher/ teacher with outstanding scholarly background and record of publication of research journal articles, essays and book chapters as well as art exhibitions in Ghana, Canada and the United States. His research is interdisciplinary in scope clustered within the areas of curriculum development, teacher education, gender studies, Africentric studies and critical multiculturalism. 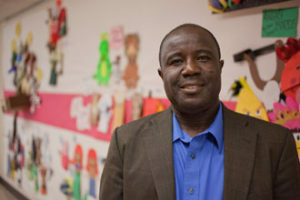 Dr. Adu-Poku is a recipient of two prestigious international dissertation research awards from Canada and the United States of America– The 2003 inaugural Arts Researchers & Teachers Society Dissertation Award (CACS-ARTS) from the Canadian Society for the Study of Education, and the Arts & Learning SIG 2004 Dissertation Award from the American Educational Research Association respectively. He is an active member of the National Art Education Association, American Education Researchers Association. He has served as co-editor for The International Journal of the Arts in Society, and as a regular reviewer of professional conference proposals.